In the fan world, blower fans are quite unique. Instead of aiming to cool an entire room, their fast, direct airflow is intended to give you a strong current of air – wherever you need it most. That’s not to say they don’t have other uses, too. Stick a bucket of ice under them and suddenly you’ve got your own arctic breeze. This article provides you with a concise run-down of the best blower fans available today. 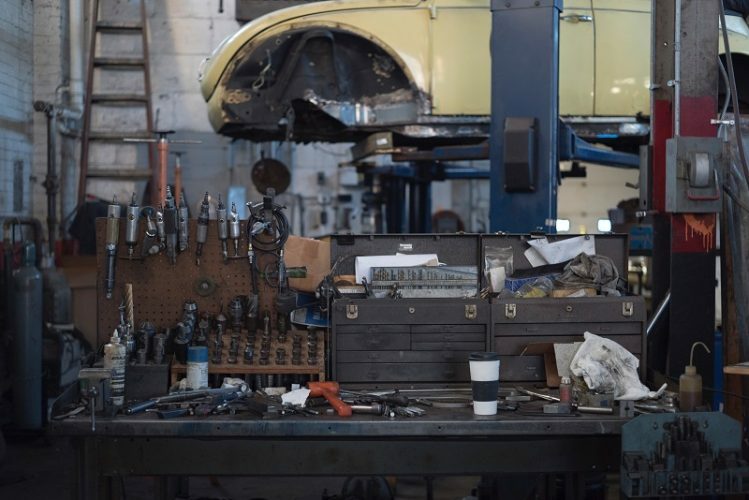 We’ve chosen a best model for key purposes – overall value, size, power, and quality – so that it’s clear which model will suit your needs the most. If you’re still not sure what type of blower fan you need, we’ve also included some quick buyer’s tips after the reviews. Great value and all-around quality - our best overall recommendation. 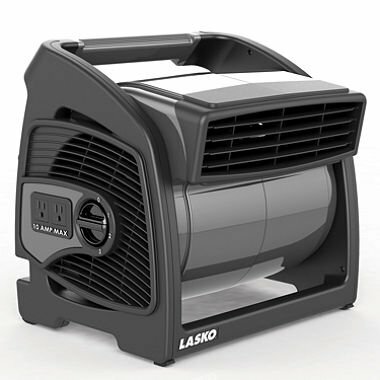 This Lasko 4900 blower fan is our pick for the best overall model. It’s not super-powerful, or particularly lightweight. But it’s got everything you need, and all for a fantastic price tag. 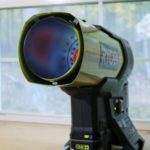 At 350 CFM (cubic feet of air blown, per minute), it’s more than capable of blasting a steady stream of air, and it’s pivotable head makes sure it flows exactly where you need it to. It’s not the smallest – check out the fan below for that – but at 14.5 inches tall it’s a great middle-sized option. Not so big it gets in the way, yet big enough to be placed behind other objects without issue. Lasko are a well-known brand when it comes to homemade fans, so the 1 year warranty that comes with the model is backed by their great reputation. In our opinion, the best all-rounder on the market. It has everything you need, with solid build quality from a reputable manufacturer, and doesn’t charge a premium price tag. If you’re just looking for a great general blower fan without overly specific requirements, we think that this is a top choice. The same power as above, in a smaller package. 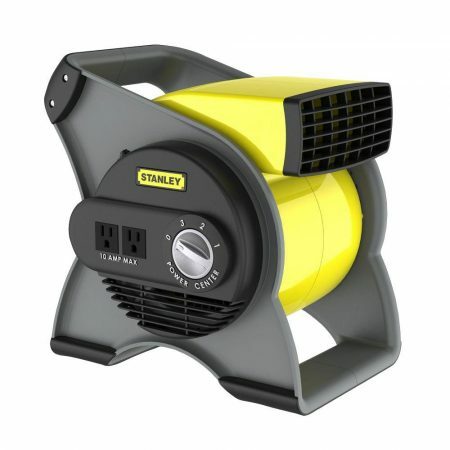 This Stanley blower fan is like the little brother to the Lasko fan above. Except it packs the same amount of power. With an equal output of 350CFM, this fan is ideal for strategic airflow. It’s also much smaller, which is great if you’ll be working in tight spaces. However, even with the same power, it can feel like less of an effect due to the more narrow width (and thus narrower airflow). Being more than 2 inches shorter than the Lasko, and 1.5 inches thinner, it really is like a baby brother. The quality is still there – with a 1 year warranty, and it’s made in the USA. Made in the USA Almost too small! Ideal if you’re going to be working in tight spaces, or are just a lover of compact appliances. While power isn’t sacrificed for the smaller size, the narrower airflow can be a little too specific. The quality isn’t lost, though. With a 1 year warranty and also being made in the USA, it’s highly durable and built to last. Top all-around quality, with a burst of extra power to boot. It’s all-around build quality is absolutely rugged. It’s larger size is backed up with increased power (460CFM), directed out of the widest output channel on this top list (15 inches). Weighing 13 lbs, it’s a bit heavier than our best overall fan at the top (10lbs). However, the easy carry handle means that it’s still a cinch to move this fan from one place to another. It’s also got a year’s warranty – from a reputable brand known for great customer service (Lasko). While we’d like to see the warranty length increased for this higher end model, 1 year warranties are the norm for these appliances. So we can’t complain too much. If you don’t mind paying a bit extra for a quality product that’s really built to last, this is a fantastic option. It’s large, durable, and packs extra power to give you as much airflow as you need. The size doesn’t restrict it’s functionality, either. It’s still completely pivotable, with a carry handle to help you move it around. We believe in paying a bit more if you’re getting the quality to match – which is definitely true here. With up to triple the other blower fans, this fan really blows. This final fan is it’s own miniature powerhouse. Packing over triple the CFM than the other fans on this list (1200CFM), it’s really the ultimate in terms of providing huge amounts of airflow. That said, it’s not overly noisy. And while the price tag is a tier up – similar to the highest quality model above – it’s not extremely expensive for what it is. Power aside, the overall build quality is solid: it’s even useable outdoors. 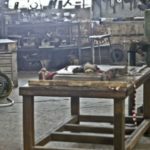 The only real downside is a very short, 90-day warranty – from a not so well-known manufacturer. This suggests poor quality, but whenever this is the case it’s reflected in the overall customer satisfaction. However, the customer reviews are great; those who have had issues have been able to get replacement fans. With that in mind, we’ve got no hesitation on placing this fan in our shortlist of the best. The ultimate solution for power-hungry tasks. Without increasing size or losing out on functionality, OEMTOOLS have put together this powerful miniature hurricane – and they’ve only slightly increased the price tag while doing so. While we’re not huge fans of the bright green looks or the 90-day warranty, it’s still a fantastic product all-around. Ideal if you need some heavy duty airflow. If you’re still not set on a blower fan, try considering each of the aspects below. They’re the most important factors that vary from one model to another, so knowing what’s important to you can help making a choice just that much clearer. 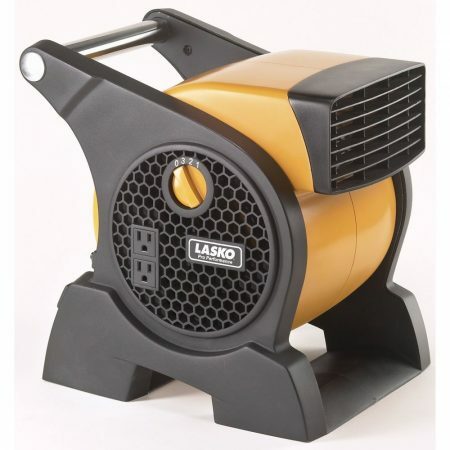 As with any appliance suited to a workshop environment, a good blower fan needs to be rugged. Able to take punches like Rocky Balboa, without looking quite so beaten up afterwards. All of our recommendations above are highly durable, but if you’re looking elsewhere, be certain that those models are, too. Don’t fall for modern looks that hide weak build quality! These small fans often don’t come with warranties beyond a year, so you want to make sure it’ll stand the test of time. One of the main reasons why these fans are bought is for strategic, directed, and powerful airflow. Make sure your fan makes this easy to achieve. Look for pivotable fans that can rotate easily, with multiple speed functions to let you get things just right. Finally, make sure there’s a comfortable carrying handle to make moving the fan around as easy as possible. Similar to ease of use, prioritise choosing a model with a long power cord. You don’t want to be failing to launch just due to an awkwardly placed plug socket. Think about whether you want your fan to be as small as possible, providing airflow while hardly being noticeable – or a larger fan that has a wider opening and could be placed behind other objects. While power is important, there isn’t too much of a variation from one model to the next – though we’ve stated any differences clearly in the reviews. 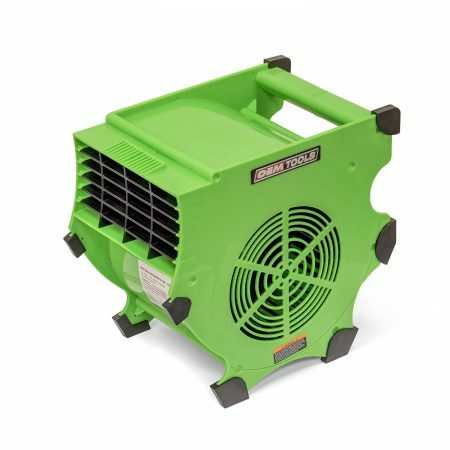 Every one of our top recommendations packs plenty of punch wherever they’re pointed – but the OEMTOOL’s 1200CFM model (Amazon Link) is also available if you need a real pocket hurricane. Blower Fans can be irreplaceable tools to keep your workspace ventilated, even in the tightest of spaces. We hope this guide has helped you find an ideal fan for your specific needs. If not, try searching for more inspiration on Amazon here. Got any comments or feedback? We’d love to hear them in the comments below, or shoot us a message via the contact page.